Expanding the domain of the ‘canvas’, here the artwork from the Ketubah can be printed onto hand made material pouches which house the glass. At the culmination of the wedding ceremony beneath the Chuppah, the groom smashes a glass item to commemorate the destruction of the Temple in Jerusalem. Even in Simchas, we hold space for reflecting upon sadder times. After which, the crowd applauds Mazel Tov as the couple have entered into eternity and become one union. 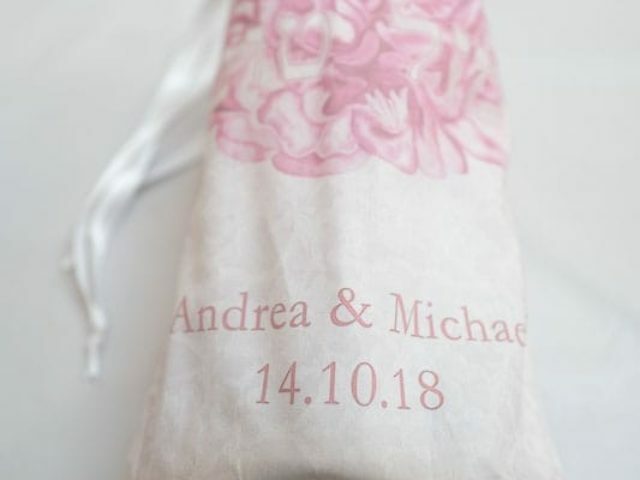 These glass pouches present another opportunity to personalise aspects of your wedding through thoughtful attention to detail. Iterate the visual identity from the Ketubah across wedding stationary, from the invitations to the benching card and now even the glass pouch – welcome to the wider wedding mispocha!